SCVHistory.com LW3095 | San Francisquito Canyon | Phillips Ranch, 3-5-1964 (R.5). March 5, 1964 — Phillips Ranch in San Francisquito Canyon. The photographer is identified as Bob Martin; his name and the address of his Hollywood studio appear on the back of related contact sheets. The photographs were made to illustrate a feature story about the ranch, probably published in the Los Angeles Times or the (San Fernando) Valley Times, which was an unrelated publication. Original 2¼x2¼-inch negatives from the Watson Archive. No duplicates are displayed here, but some frames are nearly identical. Roll No. 5 of eight 12-frame film rolls. The Phillips Ranch was located at GPS coordinates 34°34'02.6"N 118°28'04.8"W (34.567390, -118.468002) in Baird Canyon, an offshoot of San Francisquito Canyon, 4.4 road miles north of Stator Lane (the LADWP Powerhouse 2 community) on the southeast side of San Francisquito Canyon Road. 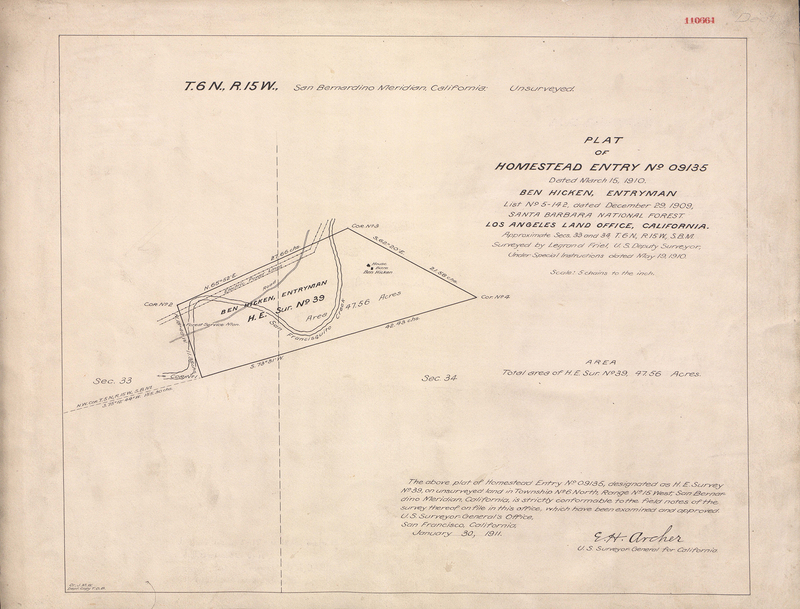 The property was originally homesteaded by Ben Hickin [cq], who on July 15, 1912, was granted a patent to 47.56 acres of land straddling San Francisquito Canyon Road (see plat below). A little over a decade later, the property was inundated by the St. Francis reservoir — i.e., it was under water from 1924-1928. Title records show the land was deeded in 1946 to Bert W. Hunick and wife Ora Hunick. The Hunick family probably lived farther downriver during the 1928 flood, because Bert Hunick lost a sister and uncle in the dam failure — Jefferson Hunick, 82, and Ellen (Hunick) Crosno, 55, daughter of Charles Hunick. 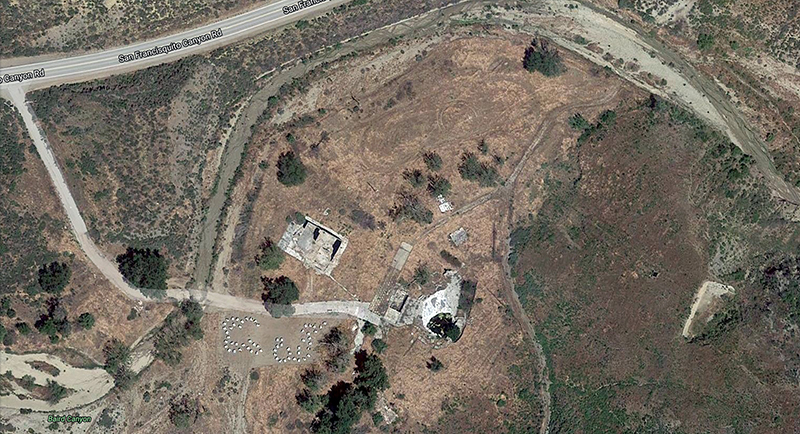 The subject property had been reduced to 29.45 acres when the Hunick family acquired it and no longer included the northwest side of San Francisquito Canyon Road. It was assigned the addresses 35500-35600. Bert and Ora Hunick's granddaughter, Lynda Deem Burke, remembers (pers. comm. 2017) that her father, Charles Deem, inherited the property after Bert and Ora died. Unofficial property records give a construction date of 1952 for a 3-bedroom, 3-bathroom house. This could be about when "Phil" Phillips — who may have operated an early ready-mix concrete company in the San Fernando Valley — and wife Gladys acquired the property. Photographic evidence from the early 1960s shows that Gladys F. Phillips (no mention of Phil at that time) operated the ranch as a resort. "(Charles Deem) sold some of the property between the two ranches to Gladys." Lynda Deem Burke said. "I have many fond memories of Phil and Gladys Phillips, as my family spent a lot of time with them. Gladys had a palomino horse named Baby that I learned to ride on. Spent many days riding horses and swimming at that ranch. It was originally built as a weekend getaway for Gladys and Phil." Carol Rising Longo, daughter of St. Francis Dam worker and survivor Ray E. Rising, has similar memories (pers. comm. 2017). "The children from Powerhouse No. 1 and No. 2 were invited there several times when I was growing up at No. 2 in the 1950s — a couple of times for swim parties, once for a Halloween Party, and once for a picnic. It was the most amazing pool and house I had ever seen as a young child. ... The kids from No. 2 would also ride our bikes to No. 1 sometimes to swim in the big pond there. We would stop at Phillips Ranch to sit under the trees and rest and even used the bathroom there at times." One key feature of the property was the Phillips Ranch Restaurant, which was a large, two-story, cinder-block building that stood next to Phillips' own home and well-used swimming pool. The ranch also sported horse stables and other outbuildings. The restaurant continued to be listed in the local 1969 phone book but had already been shuttered. In 1968, Gladys Phillips took out classified ads in the L.A. Times to sell a bulldozer, cement mixer and other personal property. Dana Knauber remembers (pers. comm. 2017) that the restaurant had been closed for a number of years when his mother, Jeanne Motan, bought the property from Gladys Phillips in the 1968-1970 period. Knauber said the restaurant was still equipped with its operational necessities — a kitchen, flatware, dishes, glasses, a full wooden bar and stools, tables and a dance floor downstairs, with more dining and banquet rooms upstairs and a hand-operated dumbwaiter to carry food and dishes between floors. "Phil (Phillips) did build the ranch to be a resort," Knauber said. "Gladys said it was very popular for quite a while, having a pool, a restaurant, an aviary, a shooting range, deer and quail hunting, horse back riding — and far enough away to limit uninvited law enforcement." All of those amenities were in serious disrepair when Knauber's family moved in. Doors and windows were nailed shut, the pool was empty and needed new filters (which were stored in a manmade cave in the hillside), dozens of peacocks roamed the ranch because the aviary was wrecked, and the side house needed extensive repair. Knauber described the single-family home: "Living room with a large fireplace, a long, wood dining table with leather covered wrap-around 'diner style' seating on the window side and captain chairs on the kitchen side and a medium sized kitchen. Upstairs, two bedrooms, a large master bedroom with a fireplace and a smaller bedroom and a bathroom. There was also a basement, which is where I slept." Knauber (Hart Class of 1968) said his mother owned the property about four years; he left for college before she sold it. The two main buildings — the restaurant and the house — had been abandoned by the time they were destroyed in the June 2002 Copper fire. The property had been in foreclosure at least twice, once in 1996 and again a month before the fire. After the fire, the former restaurant building was vandalized by drug users. As of 2017, the property is on the defaulted tax roll. Google Maps 2017. Click to enlarge. L.A. County Assessor parcel map: County aerial map 2014. 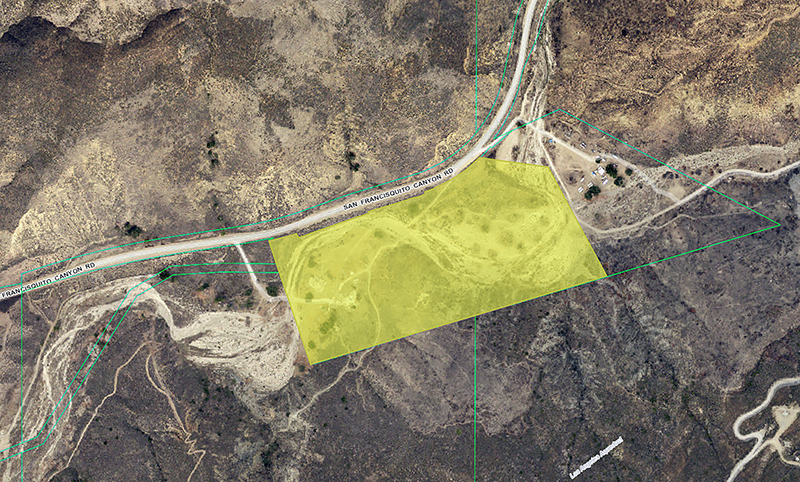 The ranch property is shaded yellow; the green lines are property lines. Click to enlarge. 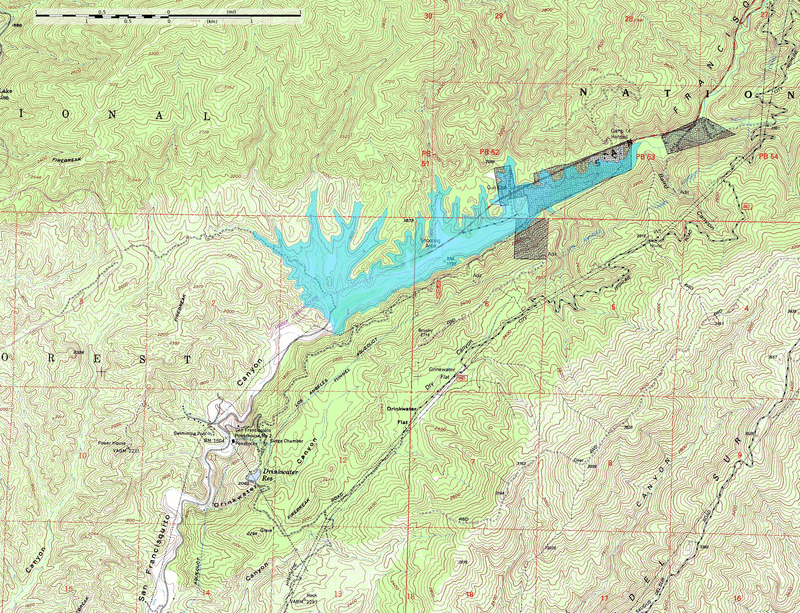 The (future) Phillips Ranch was under the St. Francis reservoir, shown in blue. Photo credit: Wikipedia/Kbh3rd. Click to enlarge. 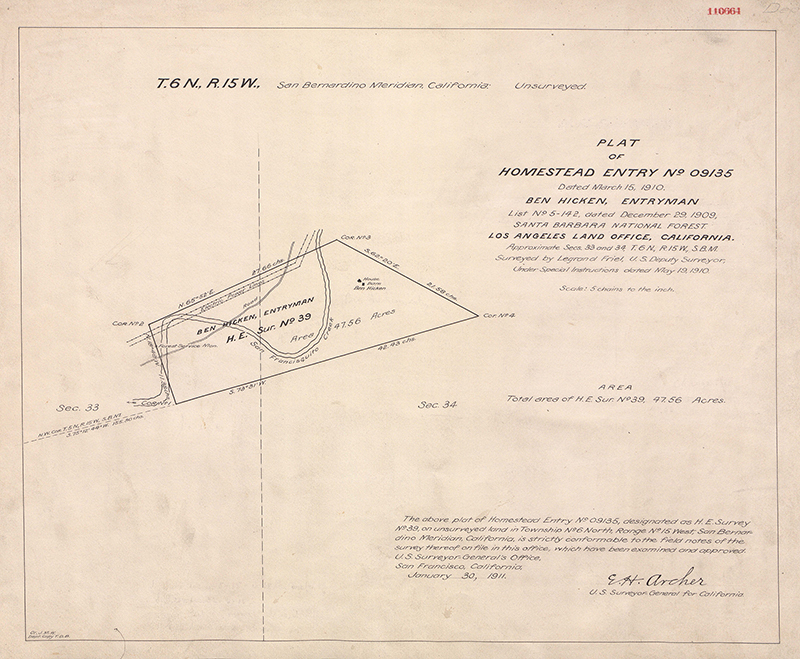 Plat of the "Hicken" homestead; "Hickin" is probably correct. Mapped in 1910-11. Click to enlarge or download original scan. LW3095: 9600 dpi jpegs from Watson Archive negatives purchased 2017 by Leon Worden. Download original scans here.